Here to join me in wishing you a Happy Thanksgiving are a flock of wild turkeys, which I spotted this afternoon behind my pine tree as they strutted near the fence of neighbors Dan and Mary Huntsman. 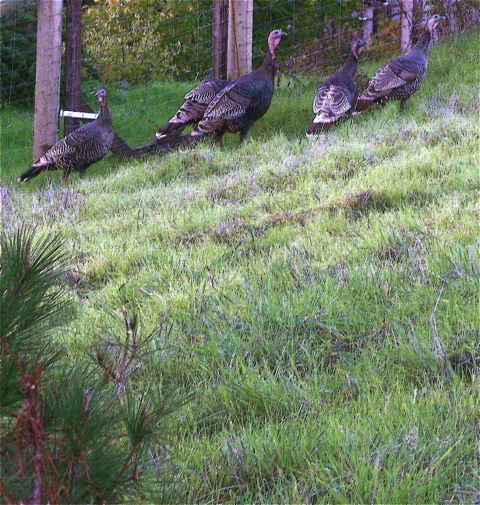 By now wild turkeys are common throughout West Marin, particularly around Spirit Rock and Flanders Ranch in Woodacre (where they’re protected), around Tomales (where they’ve shorted out overhead lines and intimidated children), and around Nicasio, Point Reyes Station, and Olema. 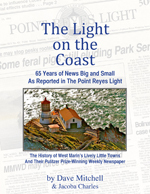 The only folks doing much turkey hunting around here anymore, however, are Point Reyes National Seashore rangers. As might be expected, the park has attempted to eliminate these “exotic” symbols of America’s first Thanksgiving celebrations. America’s Thanksgiving, as it happens, originated with two celebrations. The initial one was held by Virgina colonists in 1619 to thank God for an abundant harvest. Two years later, Massachusetts colonists held a Thanksgiving celebration after their first harvest. This second celebration was the one where the governor of Plymouth Colony invited the Wampanoag people to join them for three days of feasting, and the Indians brought venison to the potluck. 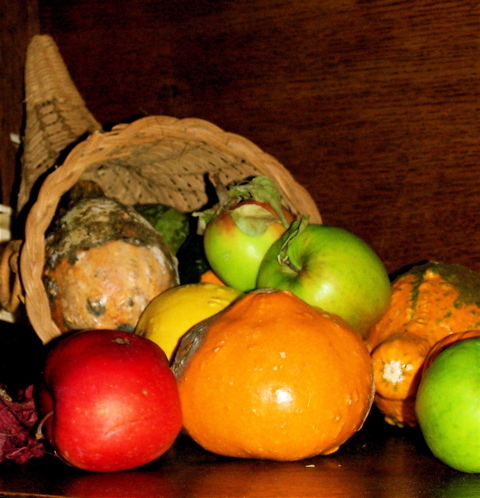 Every year at this time, I like many other people in the Western World display a cornucopia at home. I knew from my days as a Latin student that cornu means horn and copia means plenty, but until last year, I’d never looked into the mythology behind the display. It turns out to be fascinating and has to do with the birth of the god Zeus. The ancient Greeks and Romans considered Zeus the youngest son of the Titans Cronus and Rhea. Cronus, who then ruled the world, supposedly had been told that he would lose his throne to one of his children, so he gulped down each one when it was born. To avoid having another baby eaten, Rhea secretly gave birth to Zeus in Crete. She then wrapped a rock as if it were a baby and gave it to Cronus, who swallowed it whole. Growing up on Crete, Zeus was protected by a goat named Amalthea, who also provided him with milk. One day while the young god was playing with Amalthea, he accidentally broke off one of her horns. Horrified by the pain and distress he’d caused his surrogate mother, Zeus promised Amalthea that forever after, the horn would always be full of whatever good things she desired. Thus was born the cornucopia that many of us display each fall as a symbol of an abundant year. And may you too get whatever good things you desire during these end-of-the-year holidays. A reminder: This year the annual West Marin Community Thanksgiving Dinner will be held in Point Reyes Station’s Dance Palace. Turkey dinners will be served at no charge (although donations are always welcome) from 2 to 3 p.m. And for the first time, those planning to attend have not been asked to make reservations. However, people willing to volunteer time serving the dinner have been asked to call West Marin Community Resource Center at 663-8361. Sparsely Sage and Timely is powered by	WordPress 4.9.10 and delivered to you in 0.306 seconds using 50 queries.